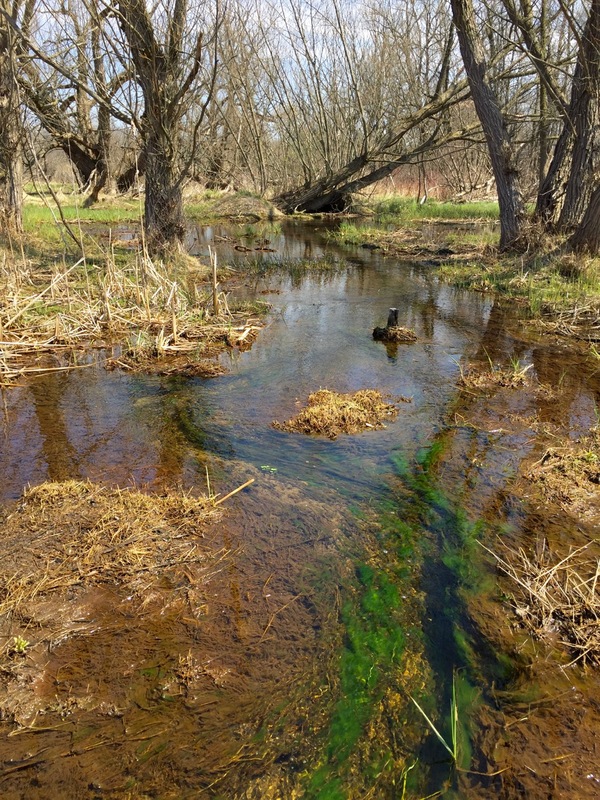 Gallagher Creek with lots of bright green algae running fast and wide after heavy rain. Right now, no one would nominate Gallagher Creek Park for Oakland Township’s most scenic natural area. Last fall, the invasive shrubs that covered large areas of the park were bushwhacked to the ground. Native wildflower seeds were sown but haven’t had time to grow the deep roots they need to fully bloom. And it’s muddy, gray early spring, after all! But each time I’ve visited over the last few weeks, wow! 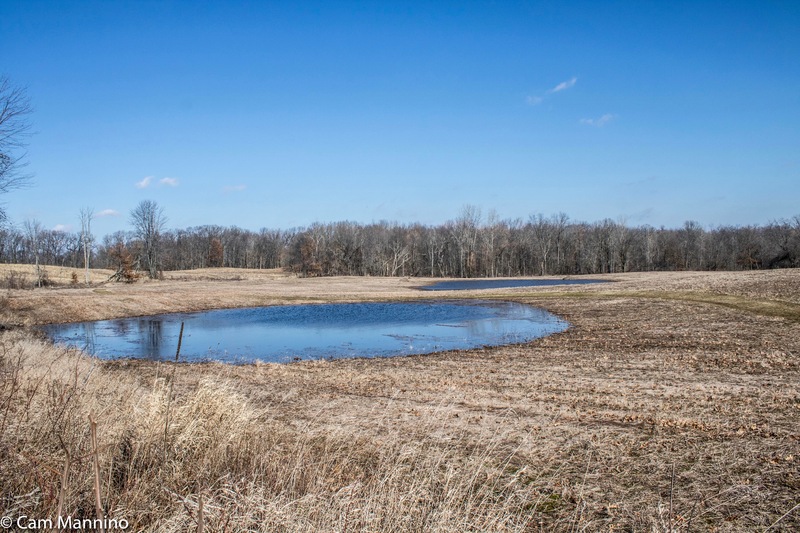 This homely little 15 acres is full of spring liveliness. 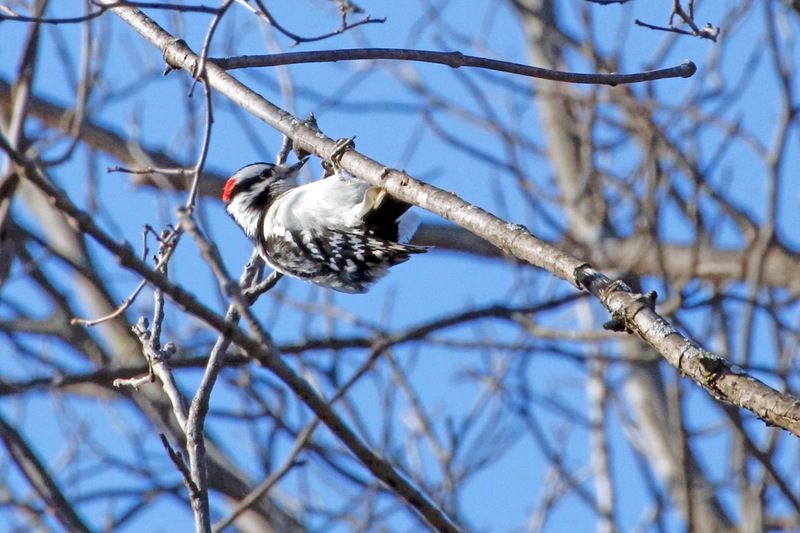 Swimming, soaring, singing, sprouting – spring arrived with exuberance at Gallagher Creek Park. An adult muskrat holding a tuber or bulb in its paws after spending the winter under the ice. A curious young muskrat in Gallagher Creek enjoys the spring sunshine. All over this small park, birds are calling, singing and searching for nests. 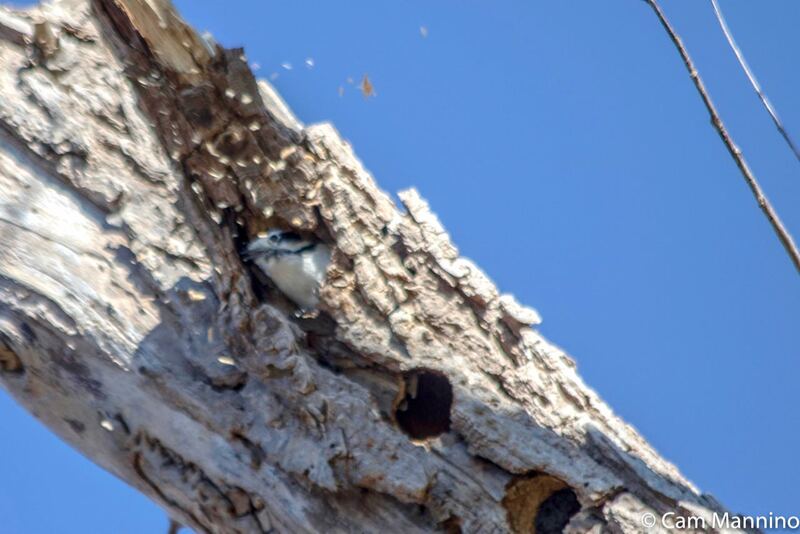 On my first visit, the chirping and liquid “thwick” of the Tree Swallows (Tachycineta bicolor) drew my eyes high into the bare branches of aging willows. 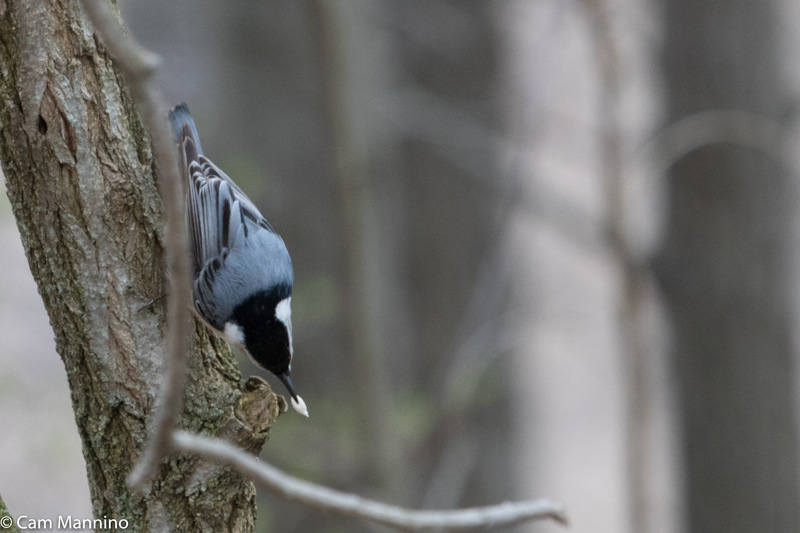 Swooping and diving, these iridescent blue acrobats performed aerial feats before resting high in the treetops. 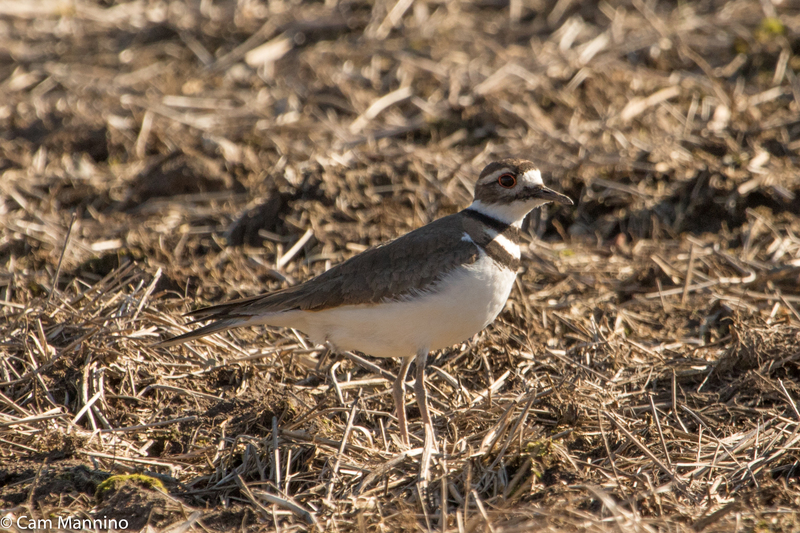 Over on the bare ground of the hillock next to the parking lot, a pair of Killdeer (Charadrius vociferus) scurried about, sometimes pecking at wet puddles, sometimes circling me with keening calls. 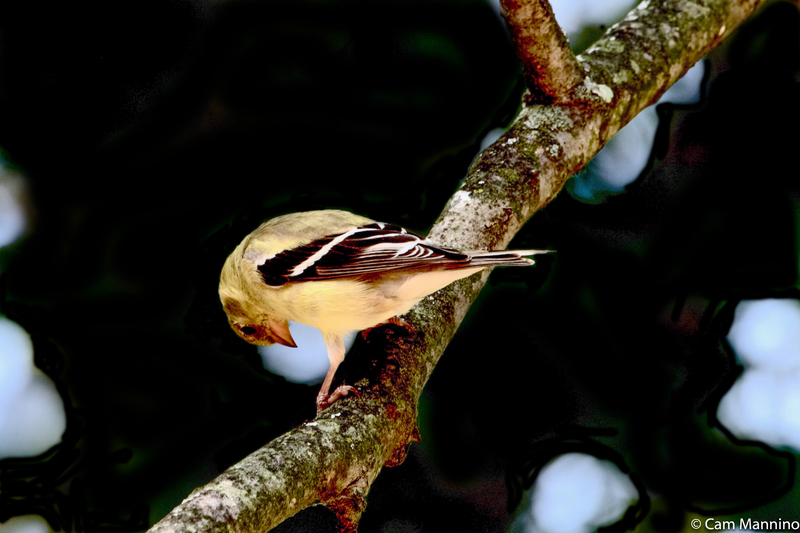 Once the female seemed to be starting her shallow nest, her breast pressed against the bare earth. They often make several small scrapes (usually only 3 inches or so across) before settling on a nest site. Cornell Lab thinks it could be a way to mislead predators, as they do, of course, with their “injured wing” trick. Here’s the male (I assume) up on the edge of the hill, keeping an orange eye on me. A Killdeer keeping a close eye on me. Those orange eyes are so striking! 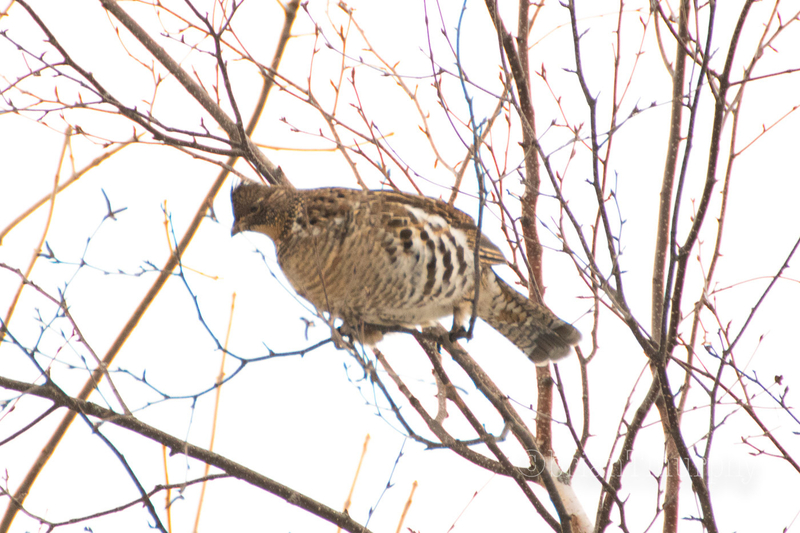 The Northern Flickers (Colaptes auratus) probably moved a bit south for the winter. But this “mustached” male is here now establishing a territory at Gallagher Creek, tapping on trees and making his “kwirr” call from the top of snags behind the creek. From below, you can clearly see the yellow undersides of his tail feathers. 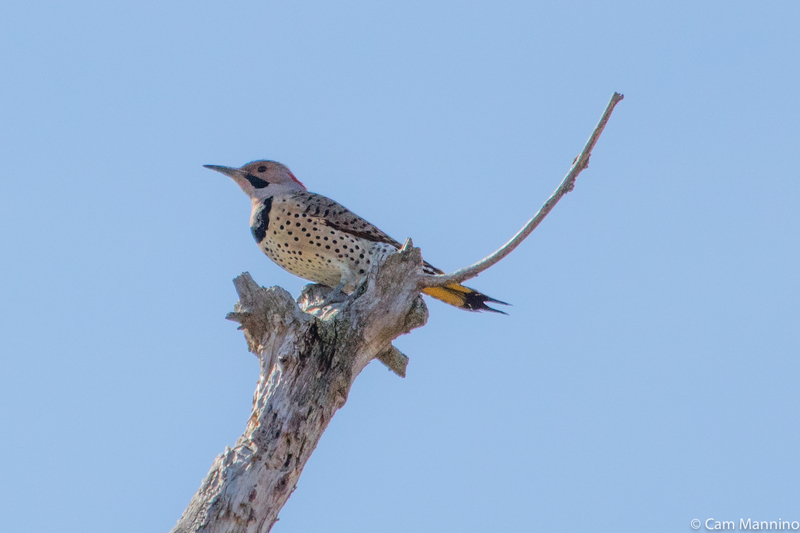 He has yellow under those elegant wings, too, like nearly all of the Northern Flickers in eastern North America. 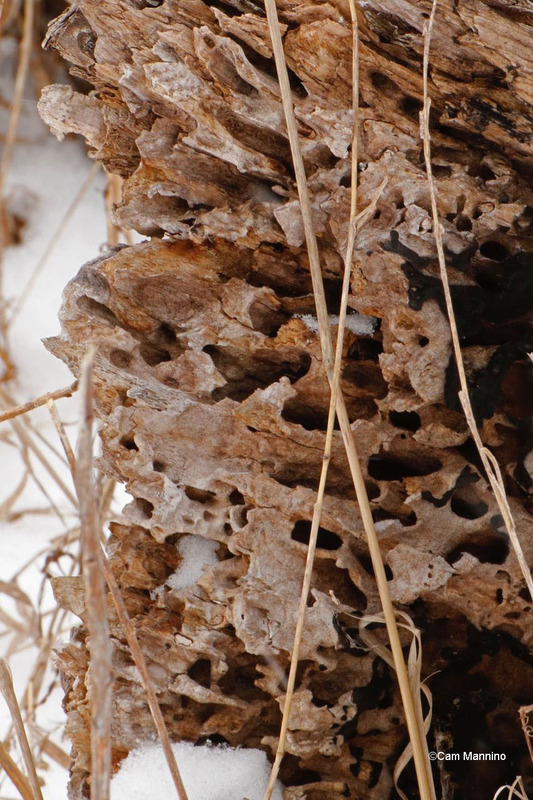 You can see why the Northern Flicker is the eastern yellow-shafted race of the species! Below the Northern Flicker, a pair of Common Grackles (Quiscalus quiscula) moved restlessly about the trees, making their clucks and “squeaky gate” whistles. 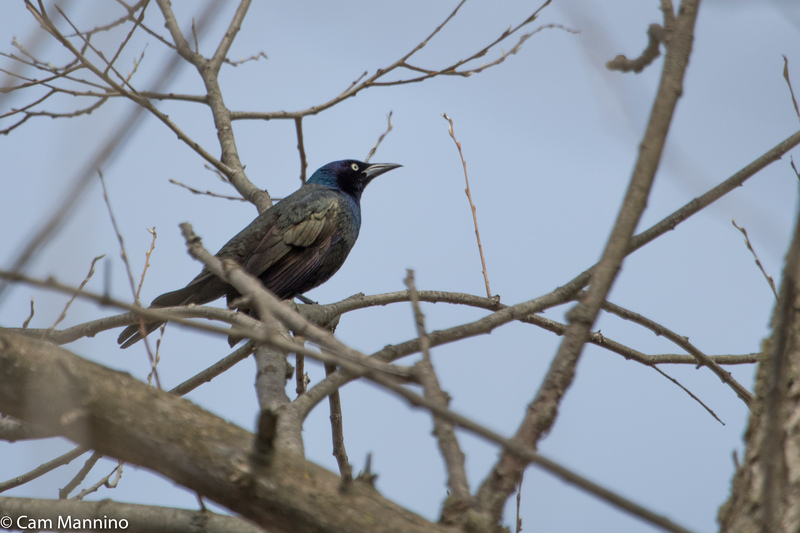 According to the Cornell Lab, “Common Grackles are resourceful foragers. 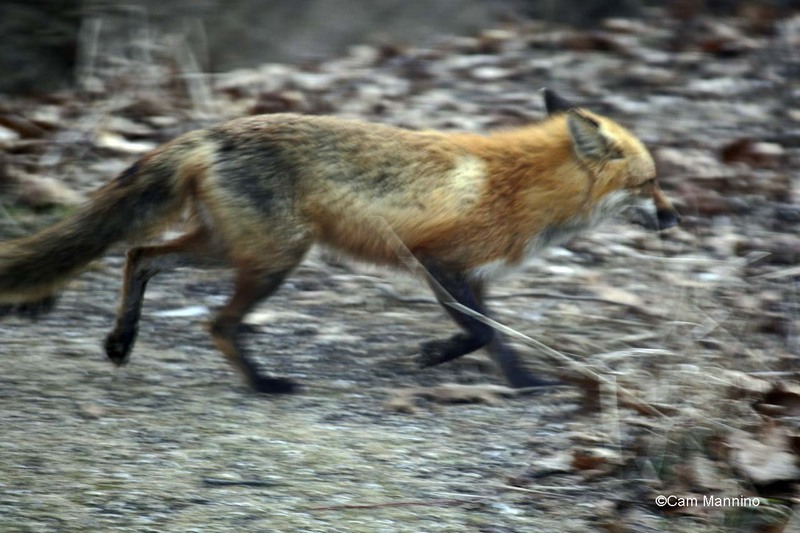 They sometimes follow plows to catch invertebrates and mice, wade into water to catch small fish, pick leeches off the legs of turtles, steal worms from American Robins, raid nests, and kill and eat adult birds.” Now that’s an omnivore and a bit of a bandit as well! Though Common Grackles look black from a distance, they are really iridescent bronze and blue with a staring, golden eye. Of course, with all that water and a cat-tail marsh in the park, Red-winged Blackbirds (Agelaius phoeniceus) take up residence there as well. This one, for some reason, chose to flip upside-down in his quest for cat-tail seeds. 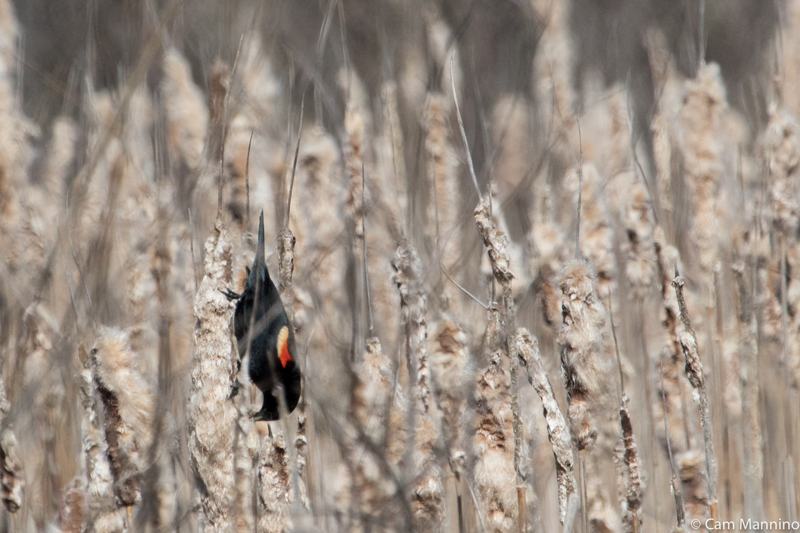 A Red-winged Blackbird goes bottoms-up to pull some seeds from a cat-tail in the marsh. 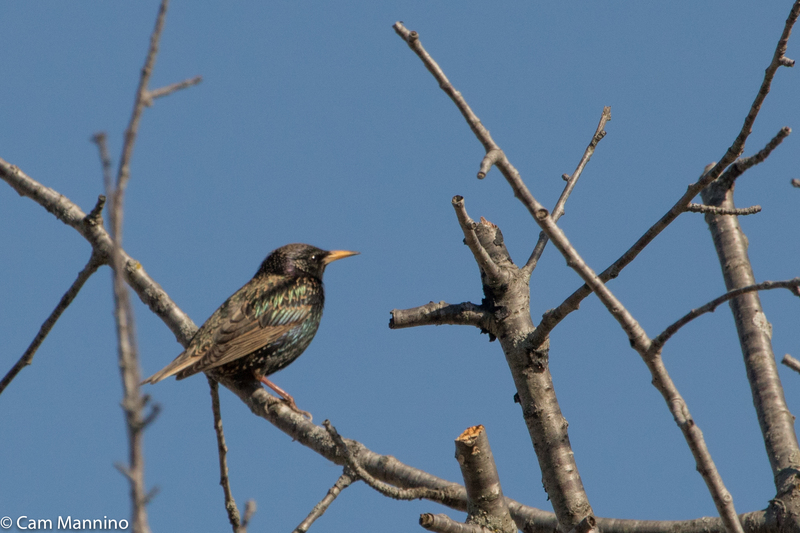 A couple of weeks ago I wrote about a European Starling (Sturnus vulgaris) at Charles Ilsley Park who still sported its fall feathers with the light tips which give it a spotted look. 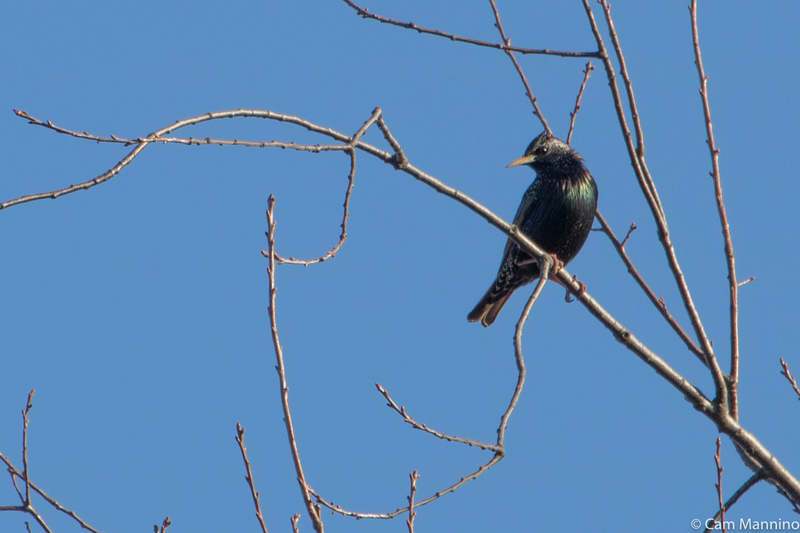 But in Gallagher Creek Park, a week later, the tips had finally worn off this lone starling, so that its iridescence would shine for the mating season. 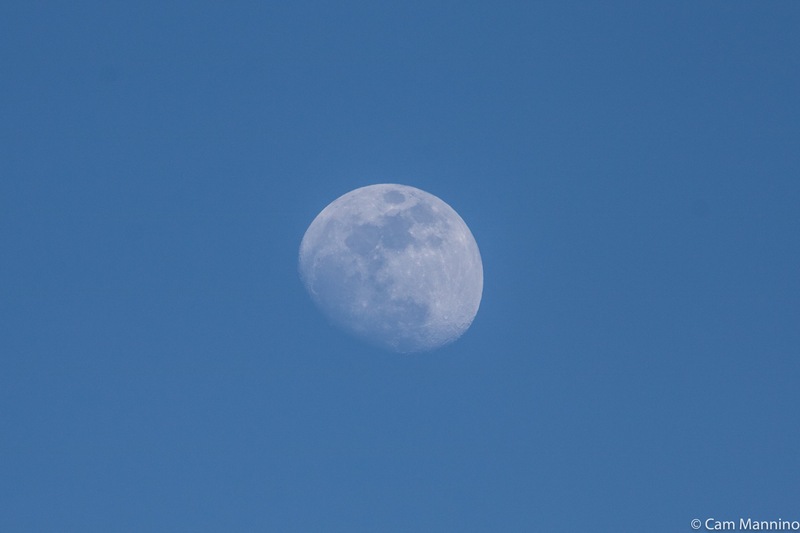 It seemed to be gazing longingly on this cold spring afternoon, perhaps waiting for its compatriots to arrive. This single starling won’t be alone for long. We usually see them gather in large flocks as the summer progresses. 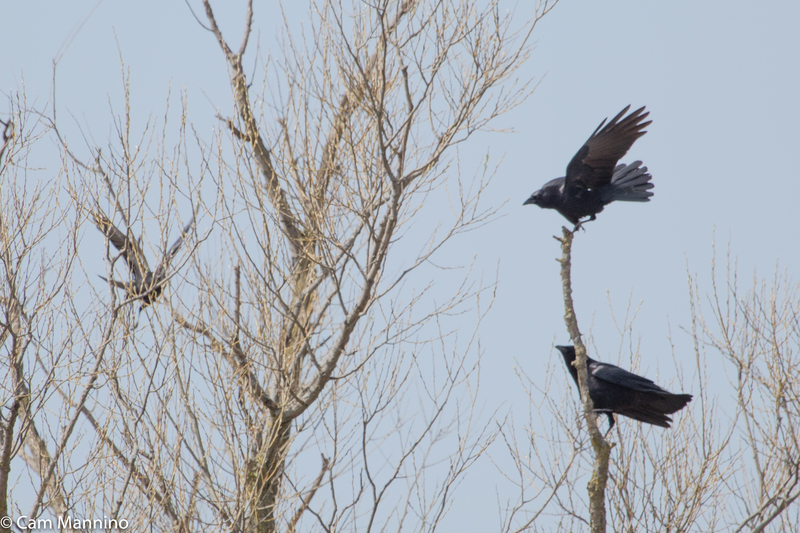 Three crows play around a surprisingly small tree. The male Mallard doesn’t quack. His call is a quieter, rasping one or two note call. The female is the noisy quacker we hear from time to time. The wetland near the stream must be home to many crayfish (or crawdads if you prefer). Their chimneys appear every few feet if you walk east from the observation deck. 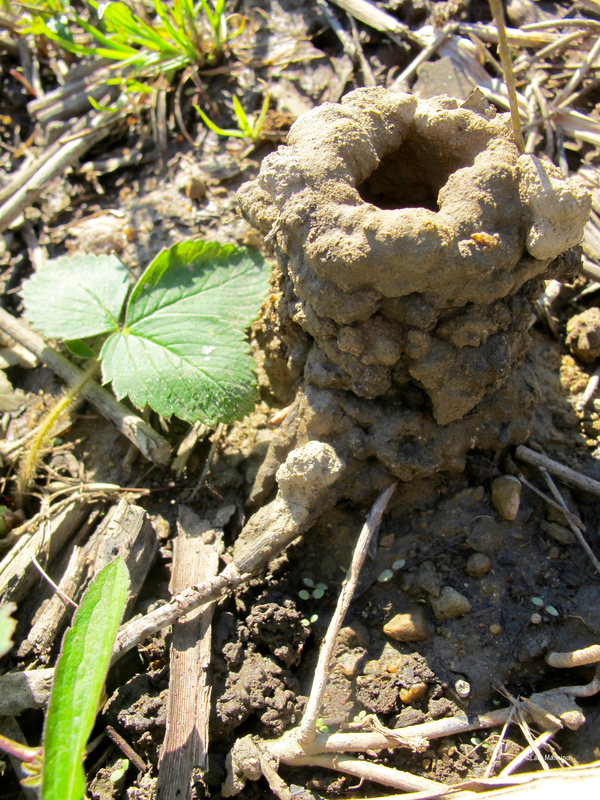 Little construction marvels, these chimneys are the openings to crayfish burrows. According to the America’s Wetland Foundation website, they build these chimneys by using their legs and mouth to form small balls of mud which they carry to the surface and arrange in rows like laying bricks! I’ve read that crayfish mostly forage at night, though the birding group saw one recently in the morning. So despite all these burrows, I have yet to spot a crayfish itself at Gallagher Creek! Crayfish “chimneys” above their burrows are plentiful right now at Gallagher Creek. The little hill where the Killdeer scampered is littered with the pretty shells of what I think are Grove Snails (Cepaea nemoralis). (I’m no mollusk expert, so if you are an expert please feel free to correct me!) 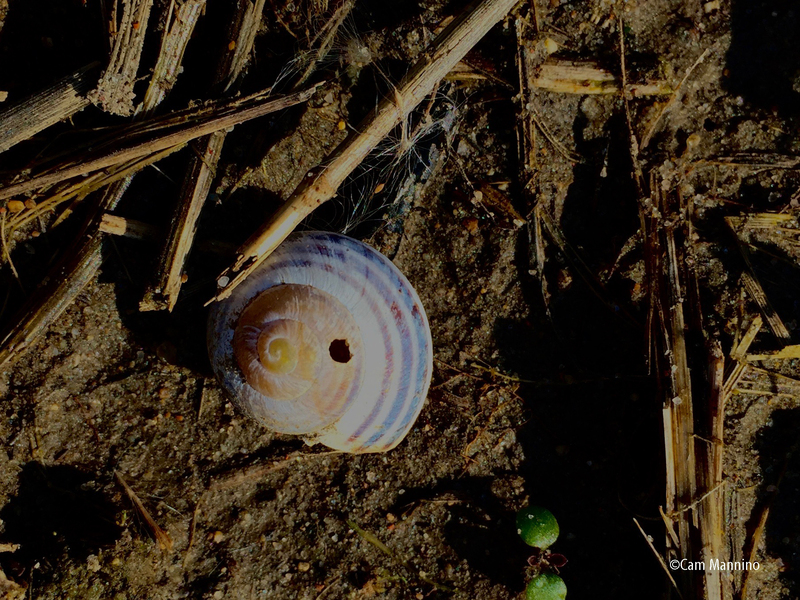 These lovely, whorled and striped shells are all empty. I’d read in a book called The Forest Unseen by David George Haskell that some birds consume snails, shell and all, in order to stock up on calcium for their eggs. But these are probably too large for most of our birds to swallow whole. I wonder why there are so many here? Grove Snails are not native, but were evidently brought to the United States in the 19th century. The empty shell of a Grove Snail (I think). Many birds eat small snails to increase their calcium before egg-laying. 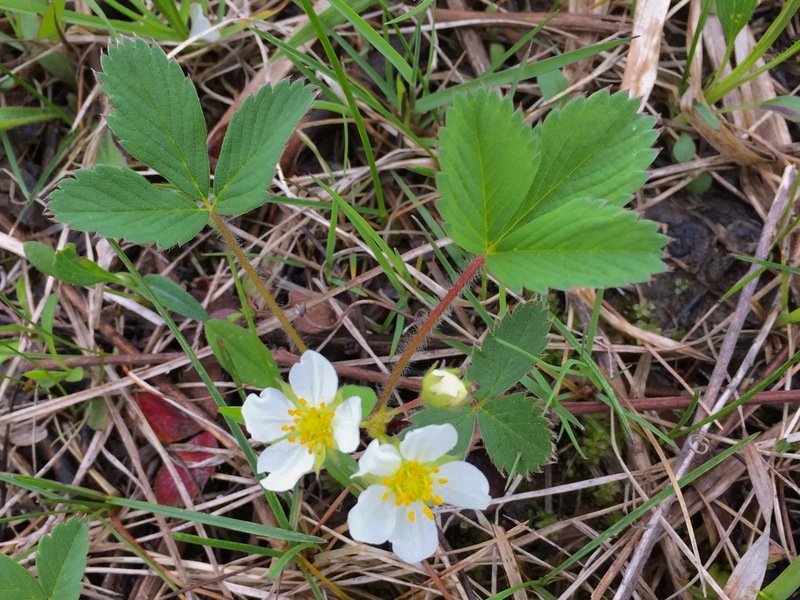 In some areas of the park, Wild Strawberry (Fragaria virginiana) flowers are everywhere. Don’t get your hopes up though for gathering the fruit in June. In my experience, the animals eat them green before they can ripen for us humans! Wild strawberry plants are bountiful at Gallagher Creek but animals generally eat the green fruit before they ripen. 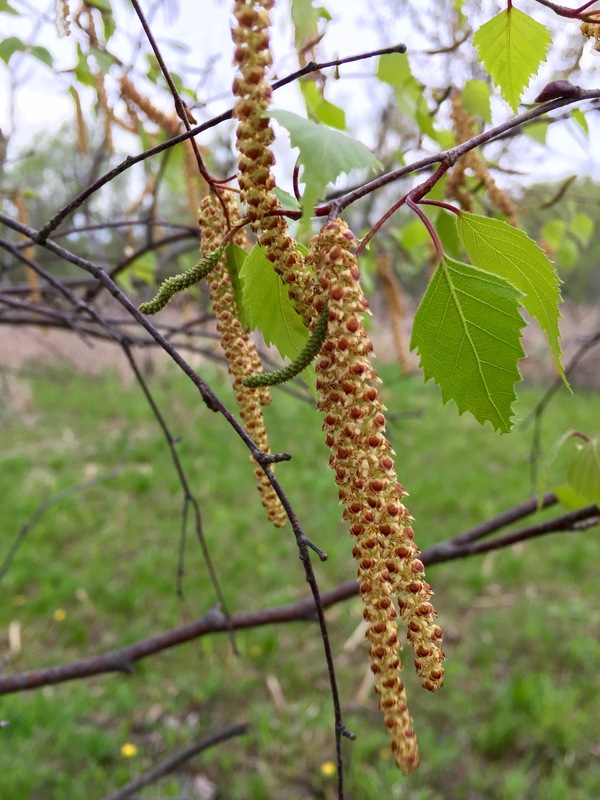 A single Paper Birch (Betula papyrifera) produced long male catkins that are, as Ben put it, “pumping out pollen to pollinate the female flowers via the wind.” Birches are “monoecius” which means they produce both male and female flowers. In the right photo, the red and yellow male inflorescence (a cluster of flowers on a stem) can pollinate the more erect, green female flowers. Birches can pollinate themselves if there aren’t others of their species nearby, which is the case with this tree. By early May, the long male inflorescences were sending out pollen on the wind, while the flowers in the smaller green female inflorescences were being pollinated. 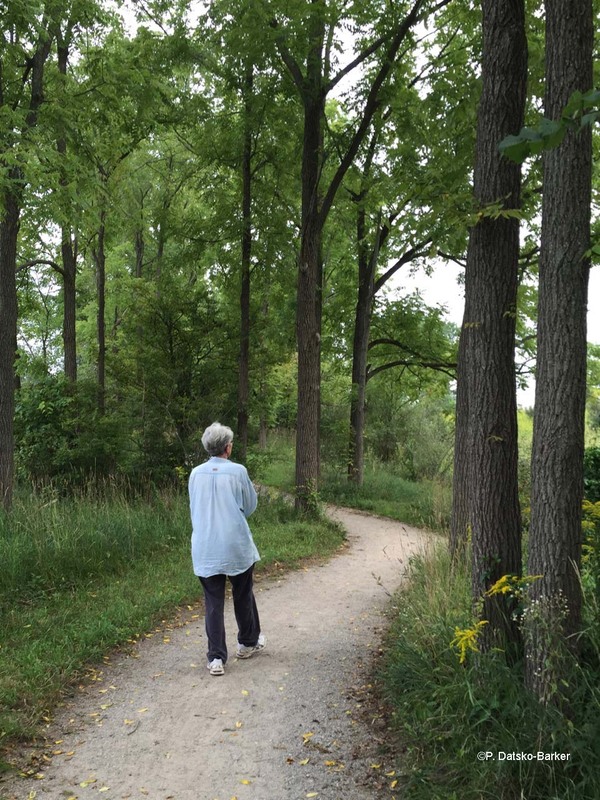 In the old hedgerow that separates the two large sections of the park stands a wispy native shrub that makes clusters of spring flowers and then a spectacular air-filled seed capsule in the fall. It has the unfortunate name of Bladdernut (Staphylea trifolia) but it’s a special native tree that is fairly unusual in our area. So laugh at the funny name and enjoy the fact that it’s here. Like most wetland areas, Gallagher Creek has big bunches of Skunk Cabbage (Symplocarpus foetidus) poking out of the mud at the edge of the stream. Out in the eastern part of the park, after the invasive shrubs were eliminated, a large patch of Mayapples (Podophyllum peltatum) got stranded in the sunlight. Evidently, the invasive shrubs provided the shade these forest wildflowers generally love. But alas, they have lost their shade and may be diminished over time. Not to worry. Seeds of many sun-loving plants have no doubt been waiting for years in the soil for those pesky shrubs to disappear. We’ll soon see what appears now that sun is warming the soil. Such an Unassuming Little Park with So Much Life! A stormy afternoon at Gallagher Creek Park. 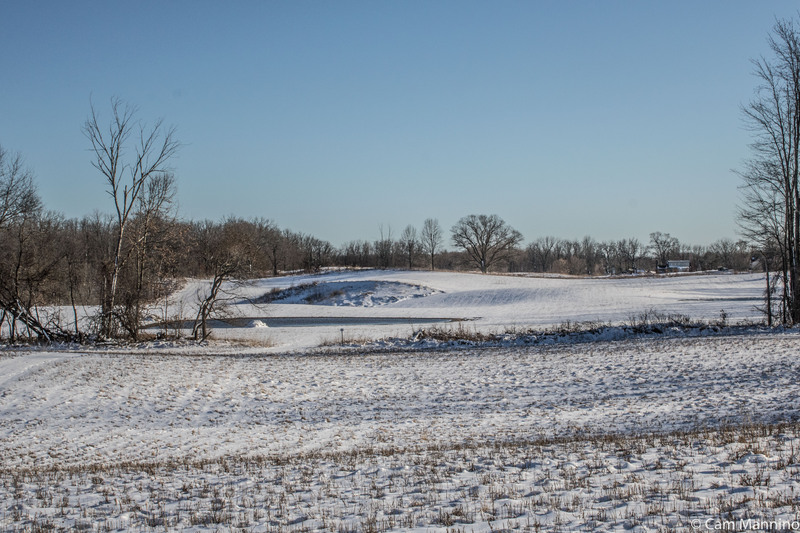 This little park will someday have trails through prairie wildflowers and a children’s play area. But for now, each time I arrive, I wonder if I’ll see anything interesting. 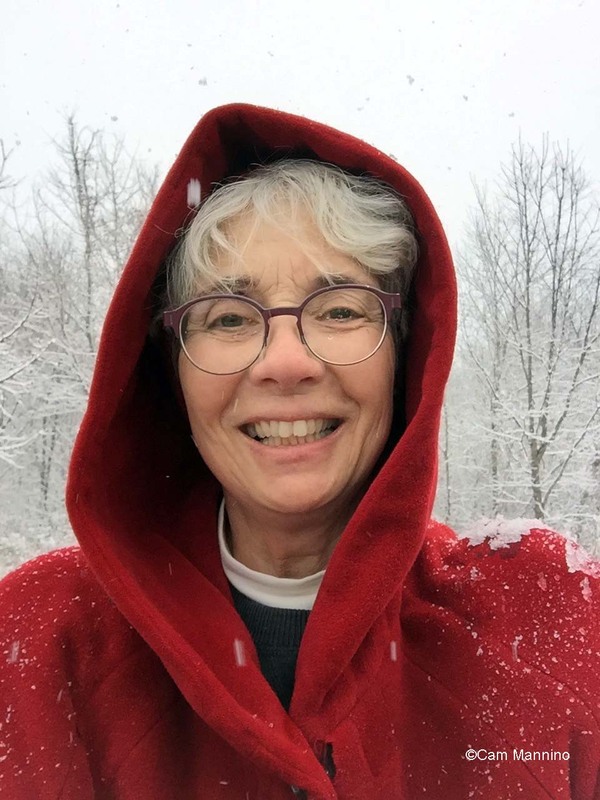 In the brown and gray of early spring a few weeks ago, it looked particularly unpromising. But then shining azure birds swooped overhead, the killdeer circled and called, and a curious little muskrat made a few quick passes by the observation deck to check out the strange animal with a camera. And then I was very glad I kept coming to this little corner of the township and its merry little creek. If you take the time to explore, you might feel that way, too. 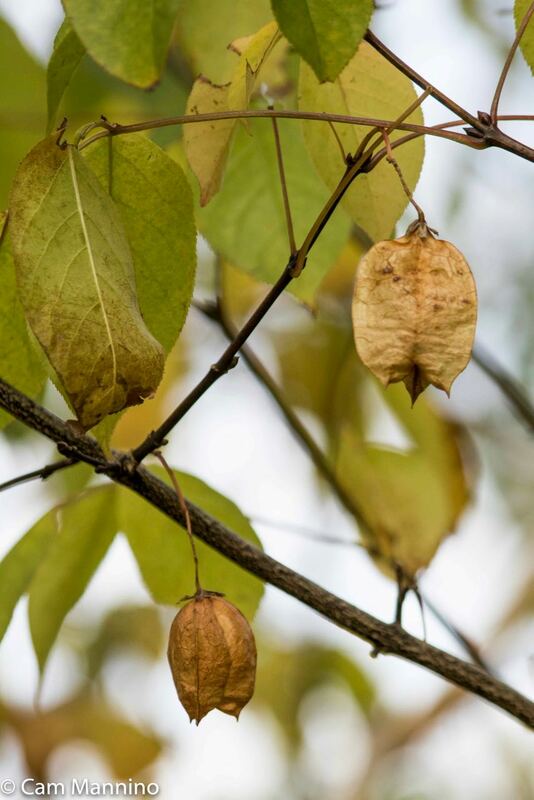 This week in Gallagher Creek Park, Ben discovered an uncommon shrub (or small tree) producing its unusual, papery seed capsules. So of course, I had to buzz over and have a look. And there it was in the southeastern corner of the circular path off the parking lot. 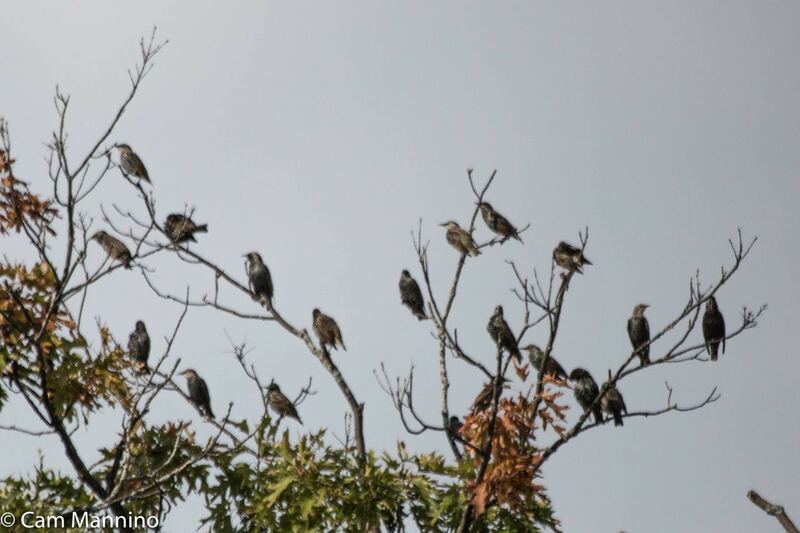 As I traveled the township, I kept coming across restless, large flocks of birds, some preparing to migrate, others just gathering before cold weather arrives. And I learned a fun, new word for the fall jitters of birds. This rare plant should be called Lantern Bush in my opinion. Instead it has one of those prosaic names I always complain about – Bladdernut (Staphylea trifolia), for heaven’s sake! Anyway…there’s a scale in botany called the “Coefficient of Conservatism.” That scale represents how tolerant a plant is to disturbances like agriculture and how faithful it is to a pre-settlement natural community. If a plant species is tolerant of disturbance and not very choosy about its habitat, the plant has a lower number on the 10-point scale. 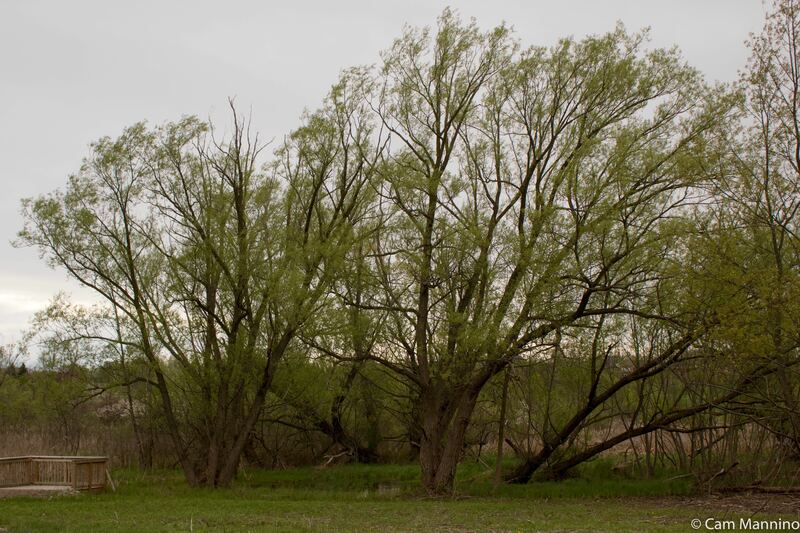 Bladdernut, however, is typically found in high quality natural communities such as floodplains and moist woodlands, so it is harder to find, at least in Michigan. Its Coefficient of Conservatism rates a 9 out of 10. Look at these wonderful chambered seed capsules, hanging delicately from the shrub’s limbs, like Chinese lanterns. The lantern-like seed capsules of an uncommon shrub at Gallagher Creek Park, Bladdernut. The seed capsules are paper-thin. They crush easily to expose their shiny, brown seeds or they can float in water, carrying them to new locations. The inside of this cool seed capsule is as intriguing as the outside. 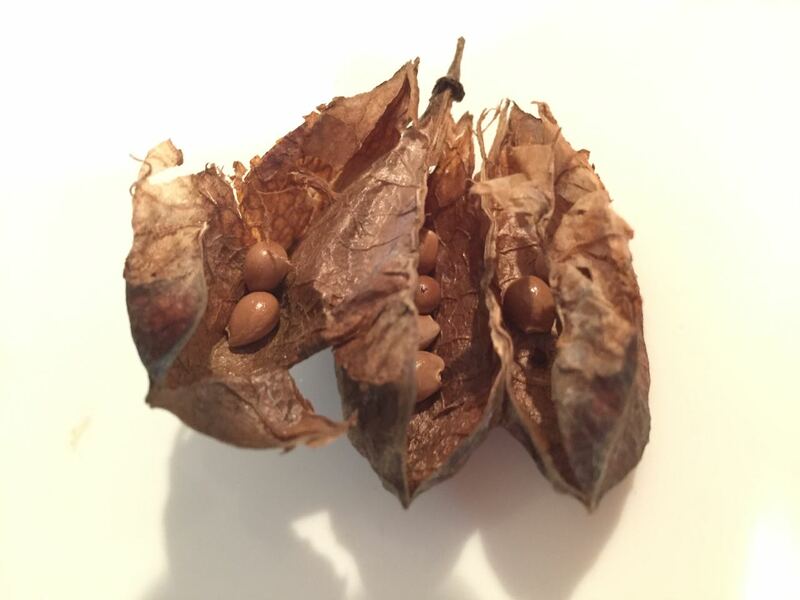 Shiny Bladdernut seeds inside their chambered seed capsule. Evidently, Bladdernut blooms for two or three weeks each spring producing drooping clusters of bell-shaped flowers. The flowers, when pollinated by a visiting variety of bees, produce these lantern-like seed capsules. Fun to see a plant I’d never noticed in all my years of outdoor exploration. You must have noticed large flocks of busy, almost jittery, sometimes noisy birds everywhere in the township right now! 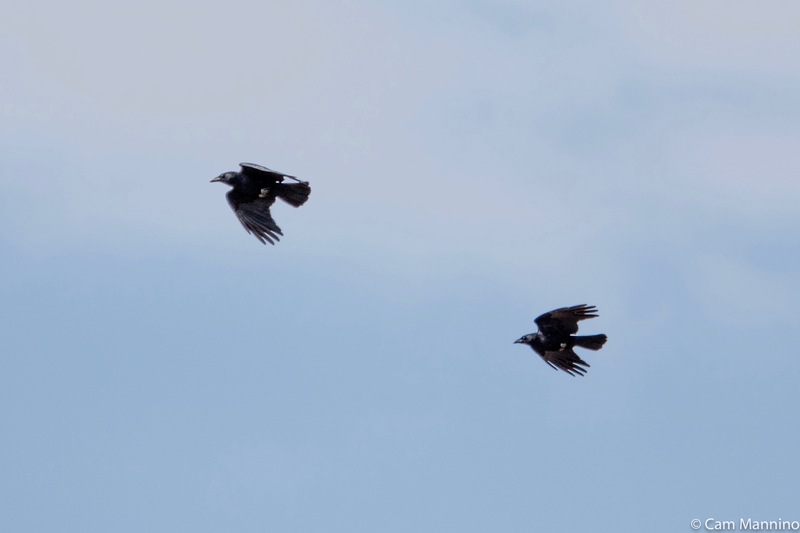 This week I learned from the Cornell Lab that there’s a name for this excitement in migrating birds – zugunruhe. It’s a German word that means migratory restlessness. (Zug = migration or movement; unruhe = restlessness.) 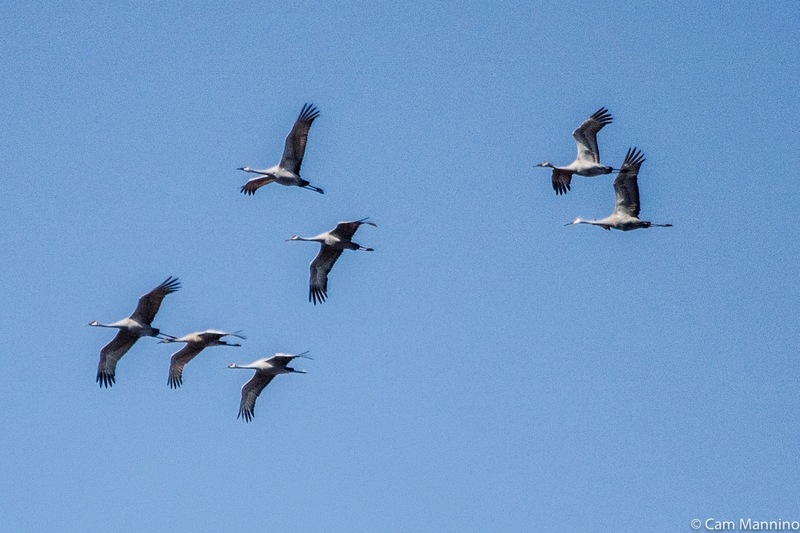 According to Wikipedia, non-migrating birds sometimes experience zugunruhe too, but at much lower levels. Scientists aren’t sure if it is a stimulus for, or a result of, increased fall feeding. 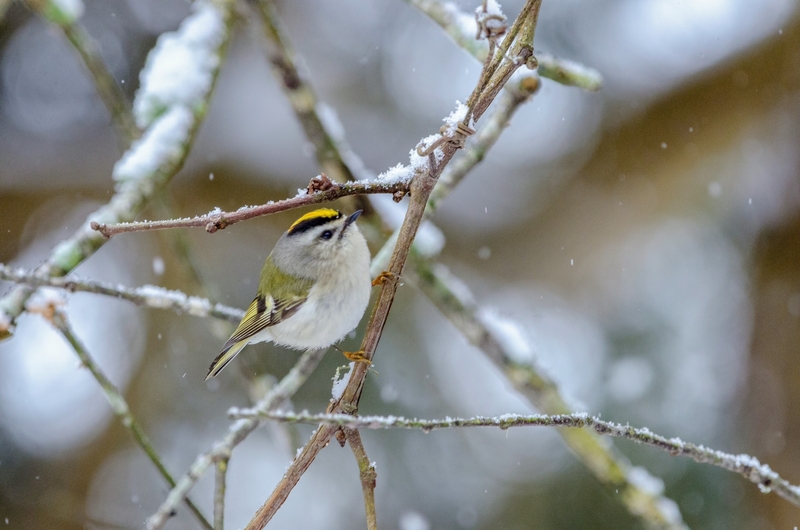 According to Cornell’s excellent website post on bird migration, “Migration can be triggered by a combination of changes in day length, lower temperatures, changes in food supplies, and genetic predisposition.” Bird species respond differently to these triggers, so some species cued strongly by shorter days moved south this fall even with the warm weather, while others are sticking around. 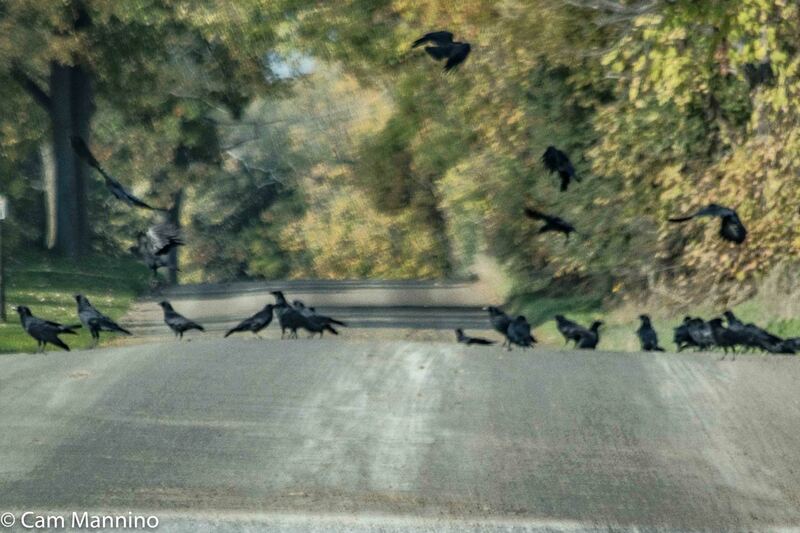 So here are some of the restless locals, some migrating, some just flocking for winter, that I came across this week – 3 flocks of them on Buell Road west of Rochester Road. 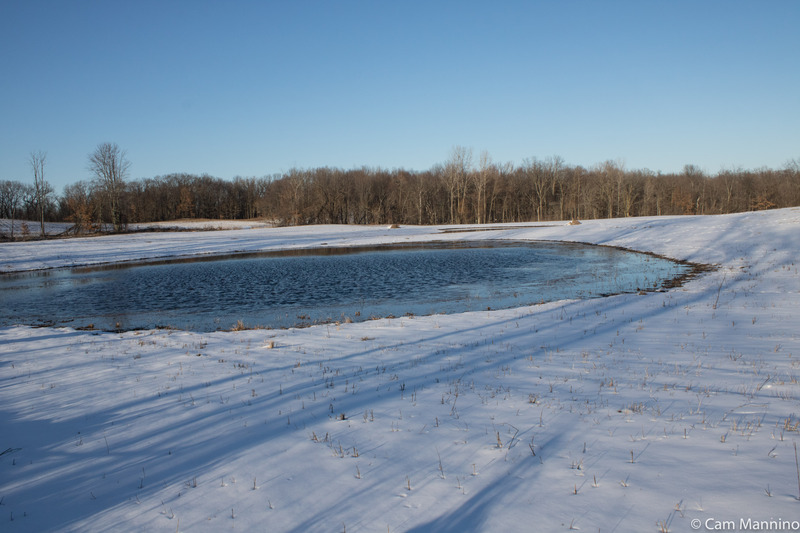 A recently plowed field on Buell Road was covered with hundreds of feeding Canada Geese (Branta canadensis), no doubt dreaming of warmer climes as they ate. 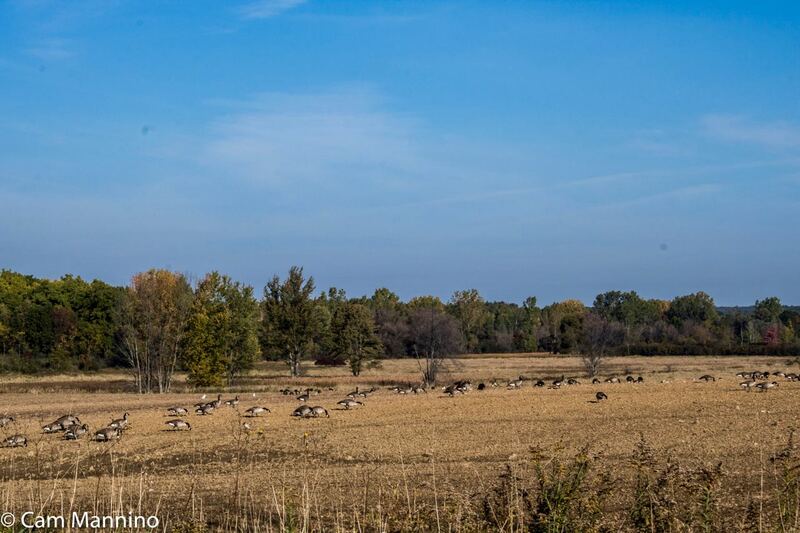 A flock of hundreds of Canada Geese eating on a recently plowed field before migration. A flock of European Starlings (Sturnus vulgaris) filled the top of a small tree and also lined the crossbars of nearby power lines on Buell. On Wednesday, Ben and I saw huge numbers of water birds on Cranberry Lake, though they were too far out to get a clear, much less comprehensive photo. Fortunately, Ben identified them through binoculars. So please click on the red links to see their photos on Cornell Lab: Ruddy Ducks (Oxyura jamaicensis), American Black Ducks (Anas rubripes), Lesser Scaup (Aythya affinis), Pied-bill Grebes (Podilymbus podiceps) and of course, some Mallards (Anas platyrhynchos). 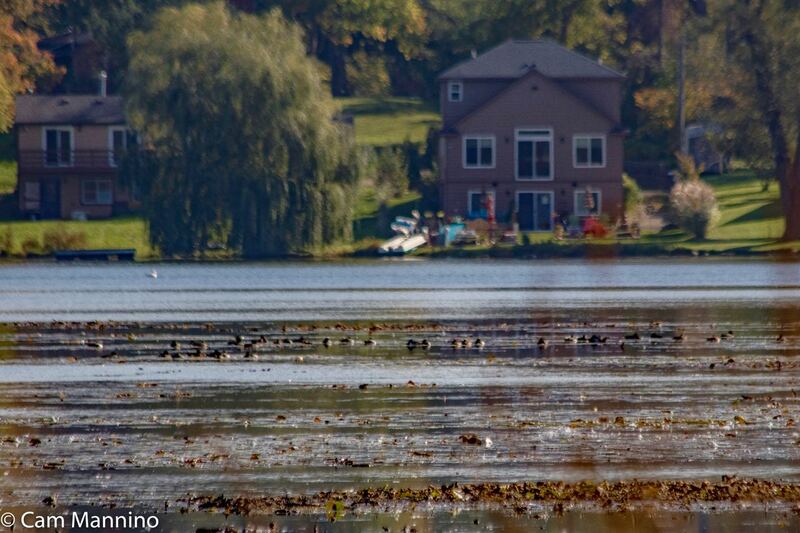 Some of the hundreds of mixed species of water birds on Cranberry Lake this week. A fine, imaginative description of zugunruhe, don’t you think? Open water in the marsh, early in the week. 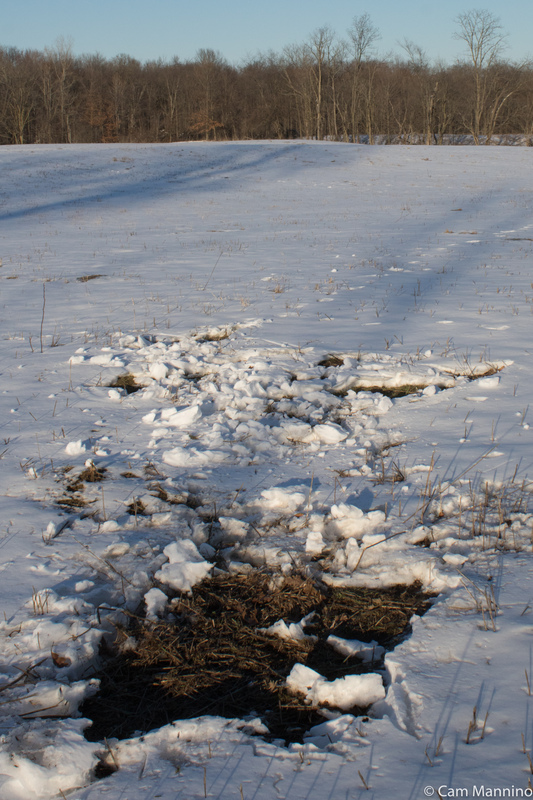 Ah, late winter – mud one day, snowfall the next. 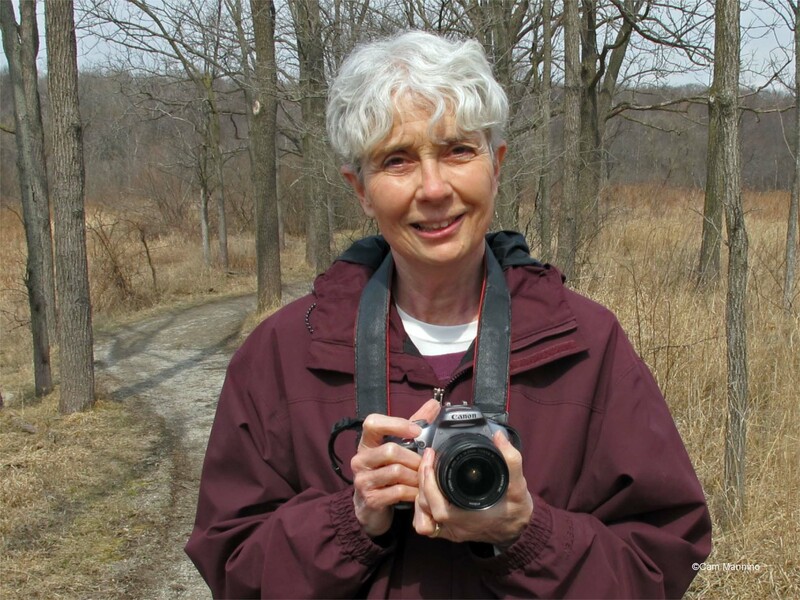 My first walk this week featured returning geese honking unseen among the marsh reeds, two Mallard pairs, muskrats feeding in open water, flocks of robins flitting among the trees. 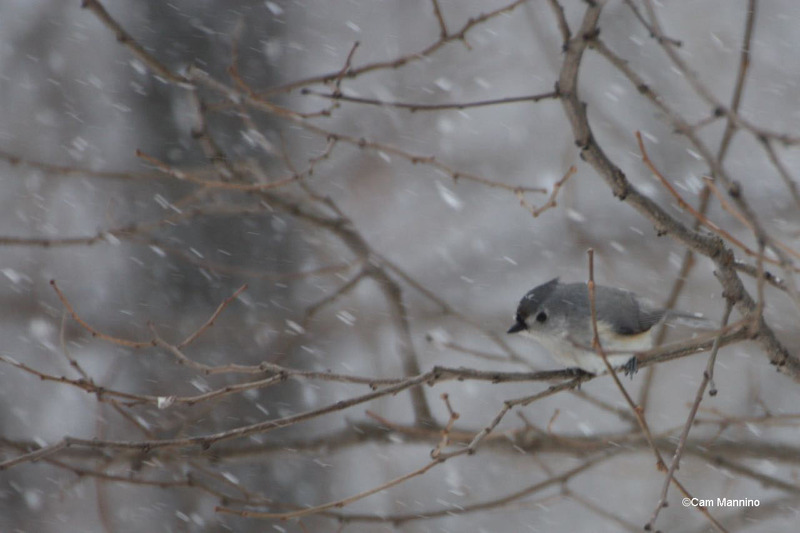 Later in the week, I arrived in a steady snowfall, crows calling overhead, and a titmouse leaning into the wind. Nothing that remarkable, really, just nature doing its between-season adaptations. 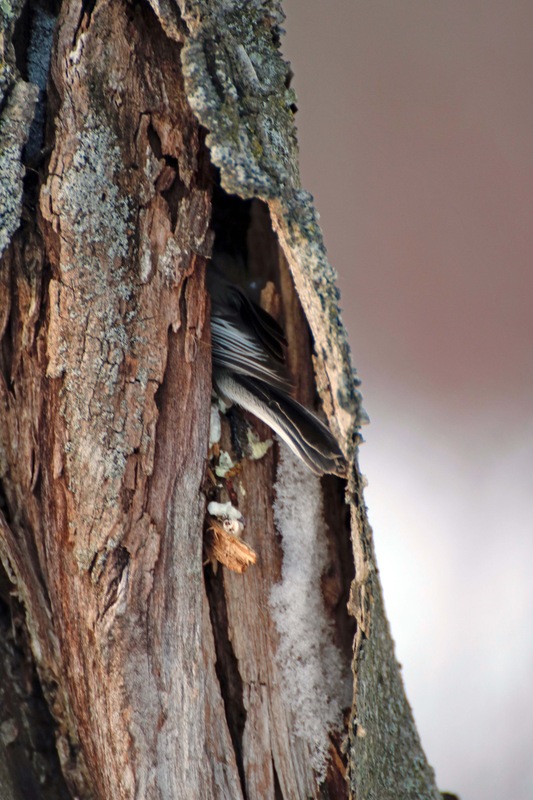 In the snowy quiet, I began noticing details – a fancy willow gall, a strange beaded plant in the marsh, a fallen log cracked open to show the galleries created by carpenter ants. So here are bits and pieces of an late winter/early spring week at Bear Creek. The weather warmed in the first half of the week. A Muskrat family (Ondatra zibethicus) emerged in the marsh as soon as the ice broke. They must have been famished for both food and sunlight after swimming and eating under the ice for months. These furry marsh dwellers went bottoms-up in the icy water, pulling up vegetation, holding it between their paws and nibbling a mile a minute! Perhaps you can see that this adult has a long stem of greenery in its clawed front foot. 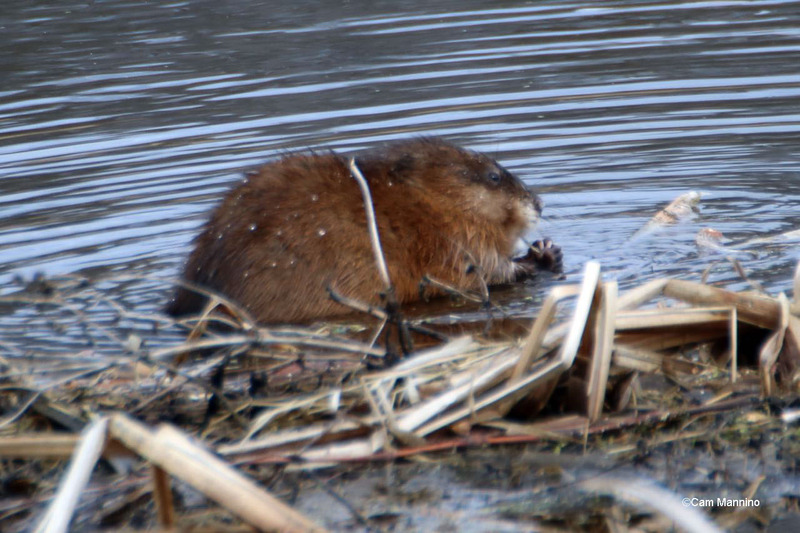 A muskrat busily eating in shallow water at the marsh after a long, dark winter feeding under the ice. 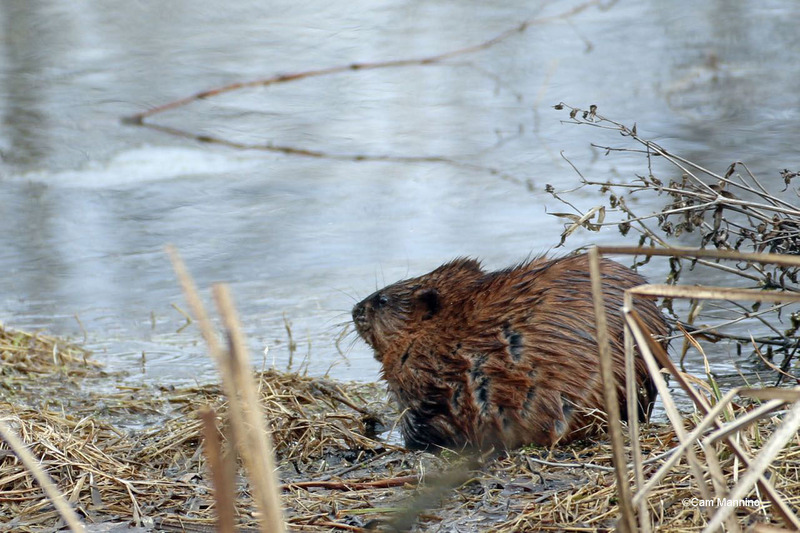 Two adults seemed to be accompanied by two young muskrats. One came steaming across the water, touched noses with its parent and then swam away as the adult ducked under for food. 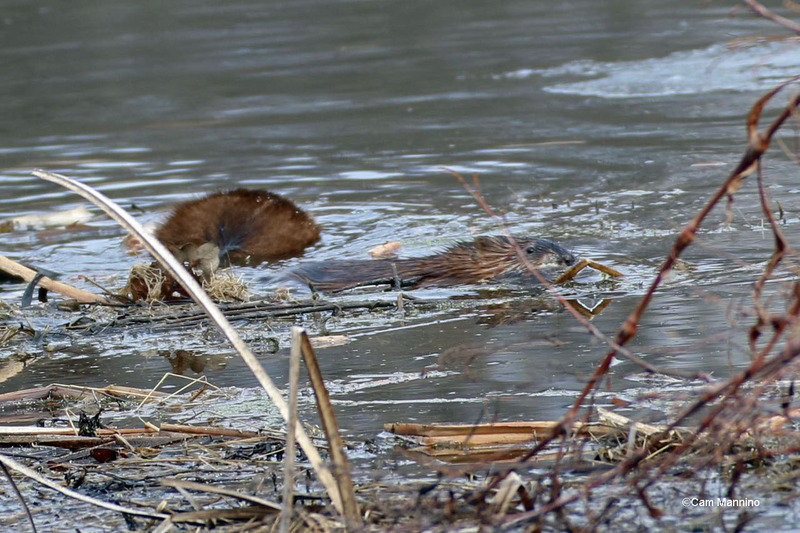 A young muskrat swims away as its parent dives for food. 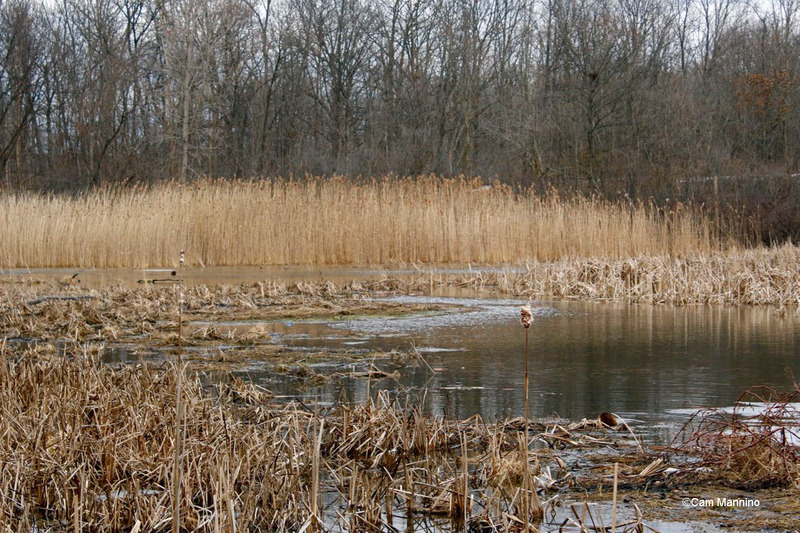 According to the Washington Department of Fish and Wildlife, young muskrats born at the end of the summer usually spend the winter with their parents. 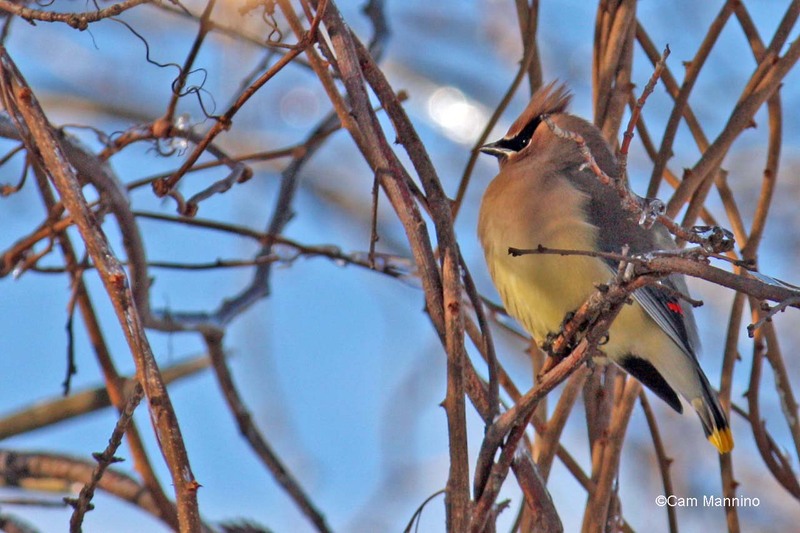 In spring, they establish their own territories within 300 feet of the adults. A close-knit family! The small muskrat above swam off to sit at the edge of the marsh, finding food at the shore on its own. The young muskrat settled on the shore to look for its own food. A crow calling an alarm against dark clouds over the marsh. 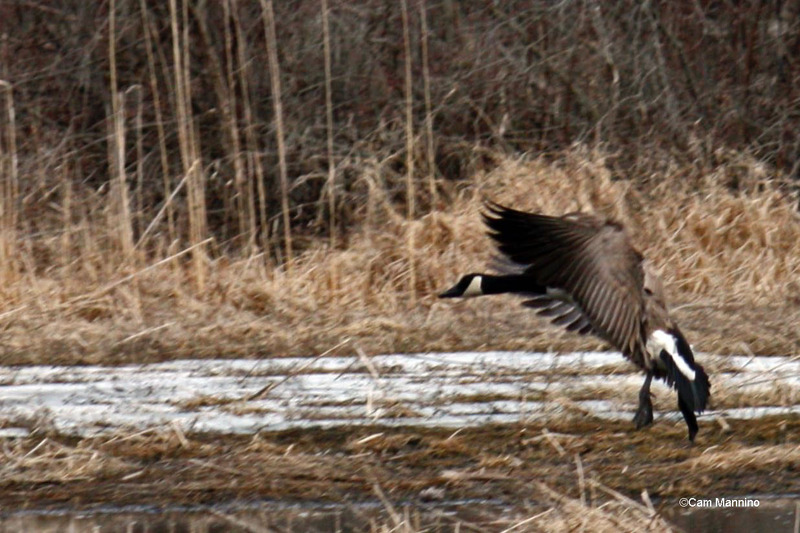 While I was there, the geese hidden in the marsh honked vigorously at them, but stayed out of sight among the reeds. So here’s a goose last March settling into the cold, snowy landscape. 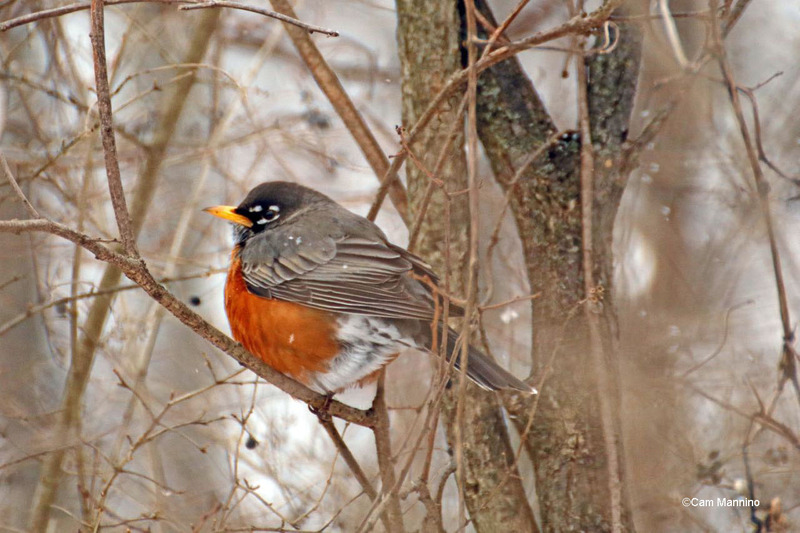 In the trees on the way into the park, a flock of American Robins (Turdus migratorius) darted back forth and across the path, some just clucking, others trying out a few notes of spring song as snow began to fall again. 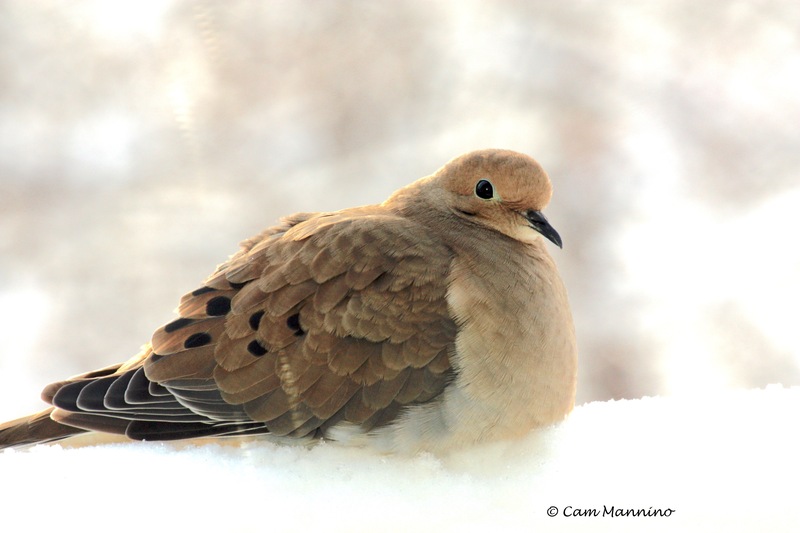 A flock of robins darted and dove among the trees along the entrance to the park. Male Red-winged Blackbirds (Agelaius phoeniceus) from the marsh below our house landed in the bushes near our feeder at home again this week – but for some reason, I have yet to see them in Bear Creek’s marsh. 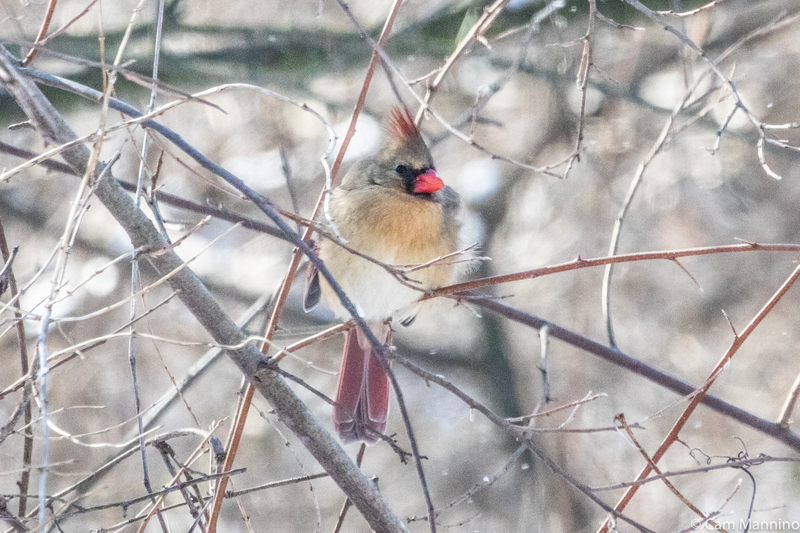 The females haven’t arrived yet so the males at our house aren’t showing off their red epaulets much and only sing a shortened version of their well-known spring trill. Update! As of a warm Tuesday morning, the Blackbirds were all over the southern end of Bear Creek and around the Center Pond, trilling in the trees! I didn’t go to the marsh today, but I’m betting they are there now too. So good to hear them on a beautiful morning! Male Red-winged Blackbirds haven’t show up yet in the marsh, despite many of them in the trees around our feeder. They aren’t showing much of their red epaulets or singing their full spring trill until the females arrive. Big, beautiful snowflakes fell quickly on my next walk at Bear Creek. 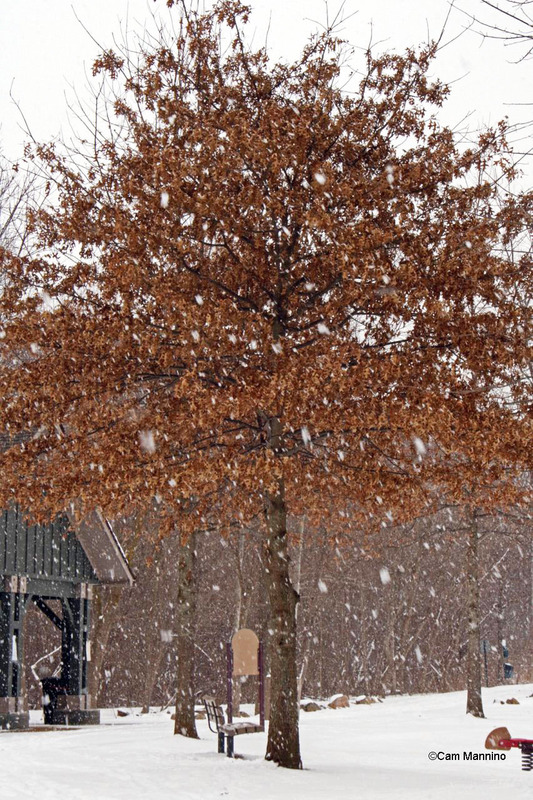 The brown leaves still rustled on the Pin Oaks (Quercus palustris) that encircle the snowy playground . When I asked Stewardship Manager Ben VanderWeide why their leaves didn’t drop in the fall, he explained that this phenomenon is called “marescence.” Deer (and in some regions, moose) nibble off twigs and bark from young trees during the winter. Young Oaks, particularly Pin Oaks, being closer to the ground, retain their leaves as a way of discouraging nibblers! According to Wikipedia, “Dead, dry leaves make the twigs less nutritious and less palatable” so large herbivores are less interested. Good survival strategy for young trees! 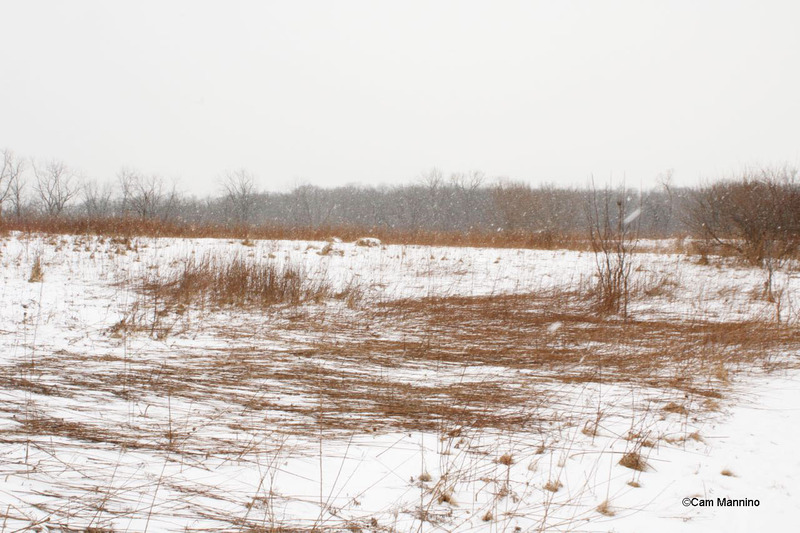 All over the park, the snow and wind had flattened last year’s Canada Goldenrod (Solidago canadensis), perhaps helping in the process of returning their nutrients to the soil. 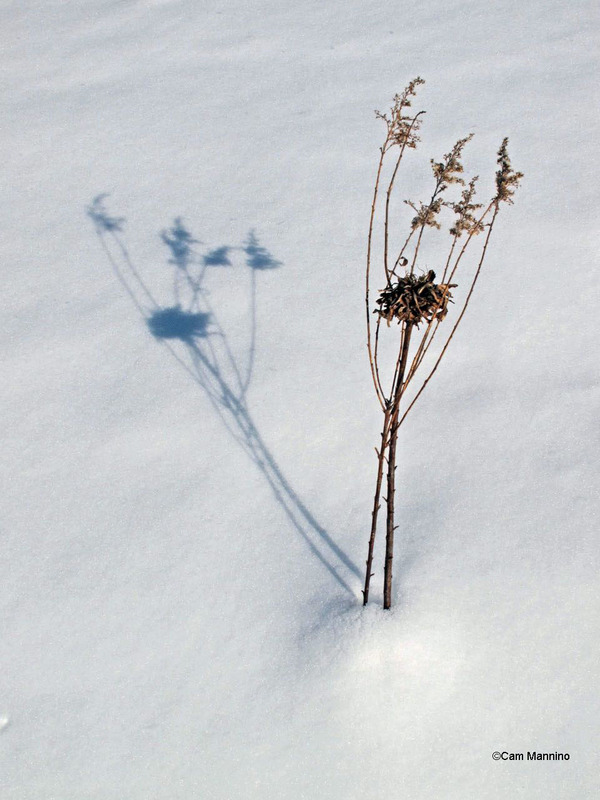 Goldenrod, ready to return its nutrients to the soil, lay flattened by snow and wind. Along the Eastern Path, an elegantly tufted Pinecone Willow Gall caught my eye. These little “pinecones” at the tips of branches, formed by the plant’s reaction to Gall Midges (Rabdophaga strobiloides) laying their eggs, can house over 30 insects eggs and larvae that are overwintering and will hatch in the spring. A Pinecone Willow Gall can host numerous insects eggs and larvae until spring. 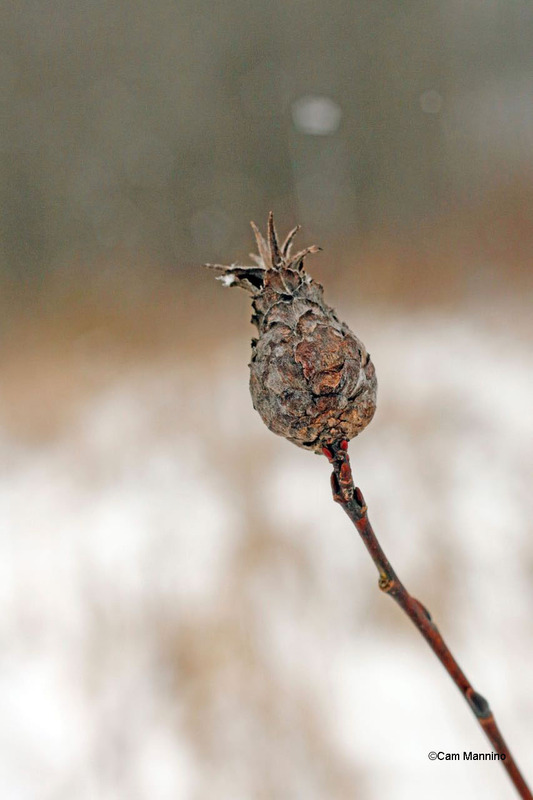 According to Nature in Winter, by Donald Stokes, a study found that 23 willow galls yielded 564 insects of different species! Birds must be appreciative of such abundance in the spring! Ben informs me that the beaded plants standing like little sentinels in the southern part of the marsh are the dark brown fertile fronds of the Sensitive Fern (Onoclea sensibilis), so called because early settlers noticed how quickly they react to frost. Those brown beads are called sori which according to Wikipedia are clusters of structures that produce and contain spores. Hence its other name, Bead Fern. The fertile fronds of Sensitive Fern in the southern part of the marsh. A closeup of the “sori,” brown beads that contain the fern’s fertile spores. 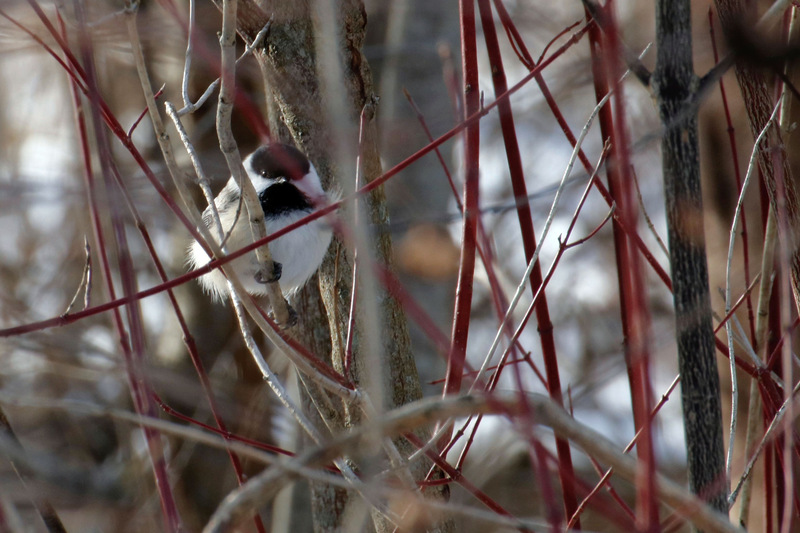 Back in the woods, birds were coping with the wind and the snow. 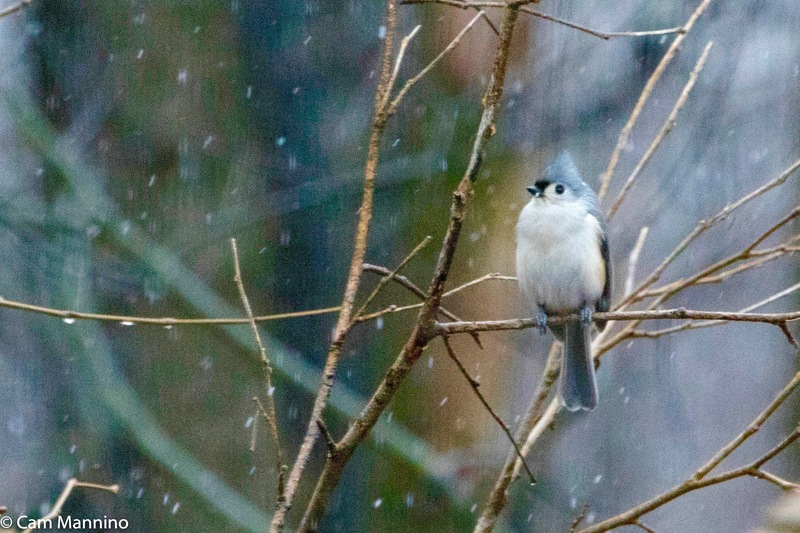 I missed a shot in the park but here’s a shot of a Tufted Titmouse (Baeolophus bicolor) from home doing the same thing. 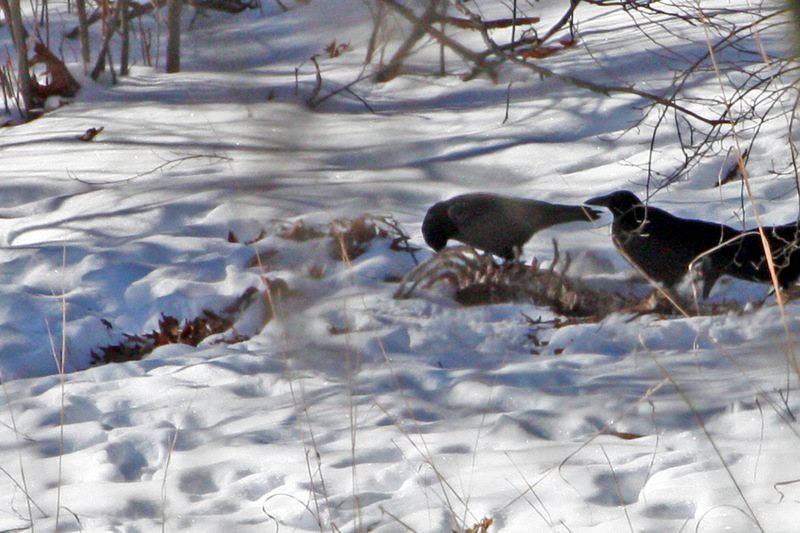 A crow took off from a tree in the snow as well. Aren’t their finger-like wings impressive? 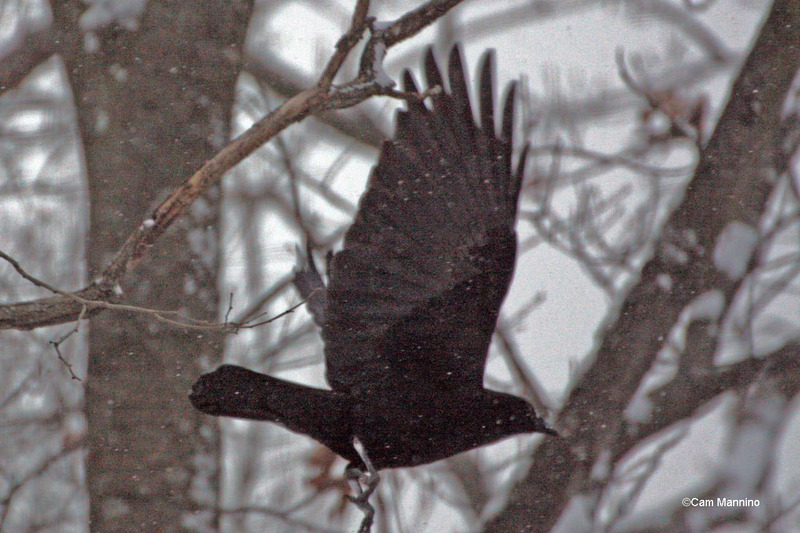 A crow taking off as the snow falls. A fallen log caught my eye because its sheared end revealed the galleries left by Carpenter Ants (Camponotus pennsylvanicus). These galleries are used to keep the ants’ eggs, larvae and pupae at the proper temperature and moisture during the summer. At the same time, they contribute to the wood’s decay which recycles the nutrients of dead trees back into the earth. According to Stokes’ book, Nature in Winter, “As winter approaches, the colony “heads for the center of a log or to the underground part of their nest in order to minimize the rigors of the winter.” Stokes says that Pileated Woodpeckers (Dryocopus pileatus) peck “huge holes in trees in order to feed on the [Carpenter]ants” during the winter. 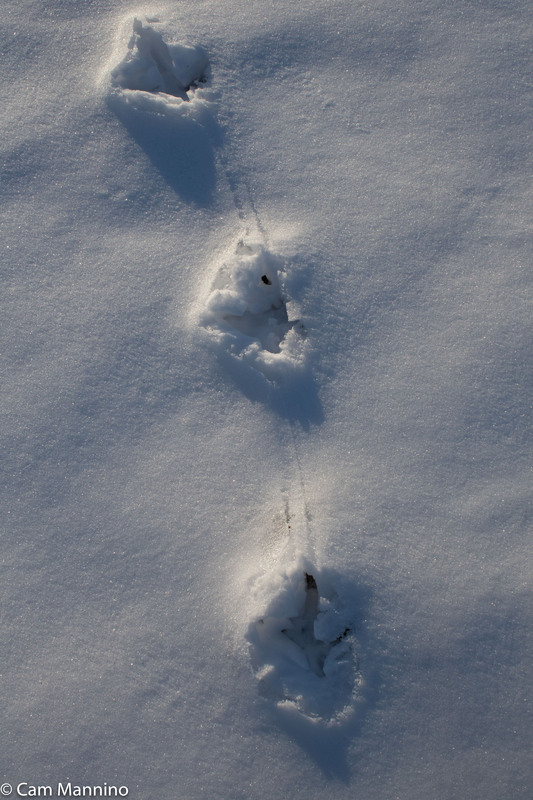 Late in the week, after another snowfall or two, two pairs of Mallards (Anas platyrhynchos), having found partners in the late autumn, landed near the Muskrat who was again foraging in the marsh. 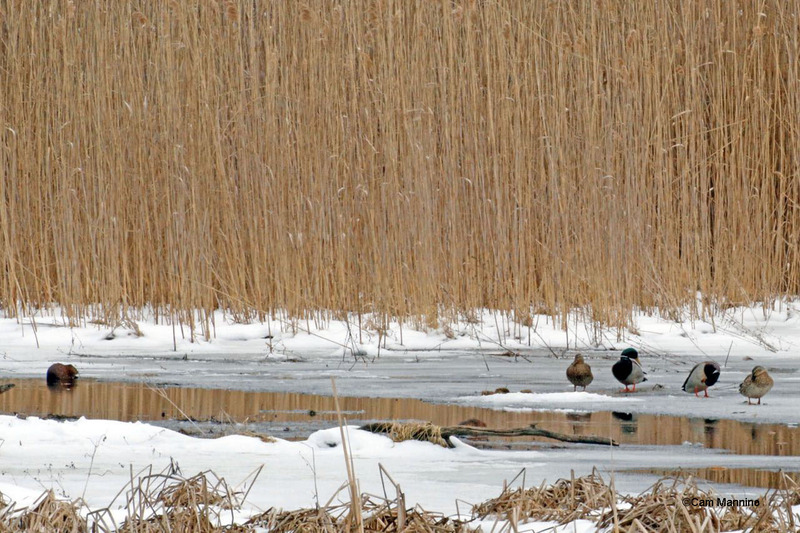 Two Mallard pairs and a muskrat in the chilly waters of the marsh. Sharp Snow Shadows and then… Spring? Who knows how many snows remain before spring really arrives? 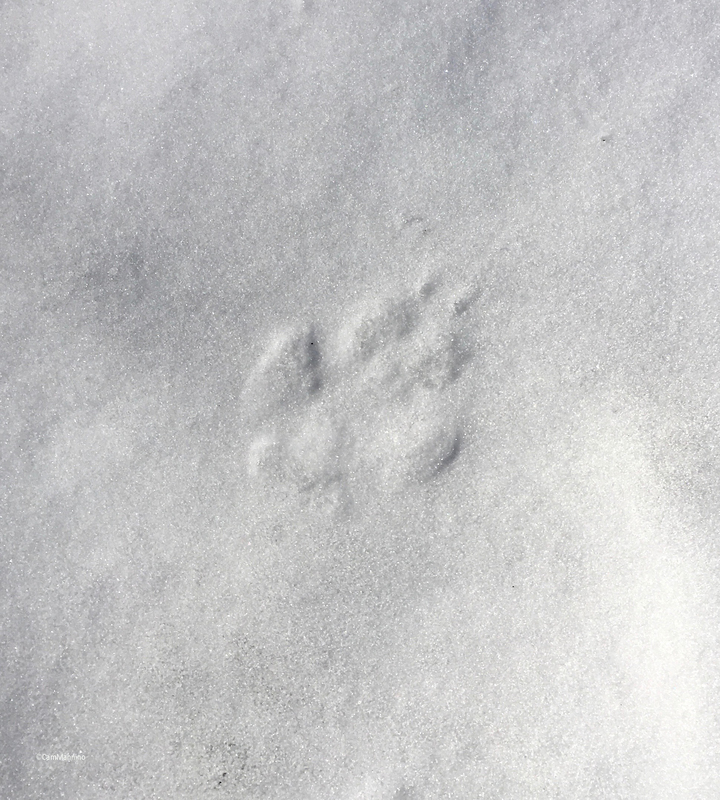 But in a month or so, the brown, white, and grey shades of winter with its sharp shadows on the snow will give way to the green haze, birdsong and trembling puddle reflections of spring. Nature brings us different kinds of beauties in different seasons. That never fails to surprise and delight me. I hope it does you too.